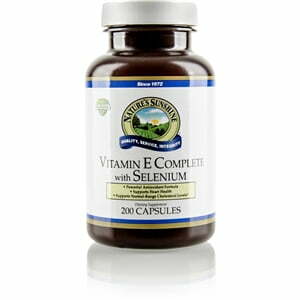 Nature’s Sunshine Vitamin E Complete with Selenium protects the cardiovascular system from toxins and supports the glandular system as well as the body’s cells. Replete with antioxidants, Vitamin E Complete with Selenium fights free radicals before they cause damage on a cellular level. Nature’s Sunshine Vitamin E contains all eight compounds that make up vitamin E from both the tocopherols and tocotrienols families. Together, these two families of compounds regulate already normal cholesterol levels and support the arteries as well as boost the immune system. 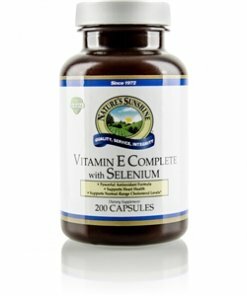 Vitamin E Complete with Selenium capsules come with 400 IU of natural vitamin E extracted from soy, including 30 mg tocopherols (alpha, beta, delta and gamma) plus 5 mg mixed tocotrienols (alpha, beta, delta and gamma). Each capsule also includes 25 mcg of selenium blended with a base of annato/soybean oil.